Woes of wind, freezing temperatures, snow and rain – these are hardly tempting conditions for a jog. But, running in the cold could be truly exhilarating and beneficial. There are a few steps you could take towards healthy body and uplifted mood. Many places in the northern hemisphere are still facing low temperatures, inches of snow and freezing rain. If running outside in the cold is the last thing in your mind right now, try to give this idea a second thought. Boosts your energy – heat and humidity during summer time exhausts the body after an outdoor workout. Winter jogging on the contrary – will make you feel energized. Creates a habit, nothing is more powerful! Repeat, repeat, repeat – afterwards, this seemingly unlikable activity will become your second nature. 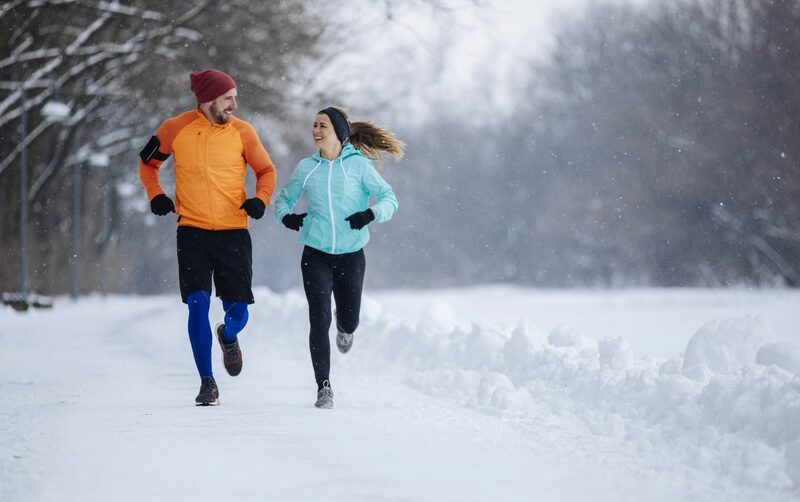 Planning for cold weather running – follow a few tips to get all the benefits from your workout. Muscles get especially tight in low temperatures – get your blood flowing before you step outside. Simple exercises – jump rope, lunges, jumping jacks, squats will increase oxygen availability and efficiency of muscles and joints. Cotton tops – soak up moisture and it takes them a while to dry which will make you feel cold. Dehydration – we could be losing just as much fluid in the low temperatures as we do in the hot summer time. Make sure to rehydrate yourself. Make yourself noticeable – when in the dark, reflective gear or bright-colored clothing items allow car drivers see you. You could also use a small flash lighter. Keep your goals achievable – don’t attempt a breakthrough training. You can gradually increase the mileage each time. In this way, you won’t put vast stress on your body. 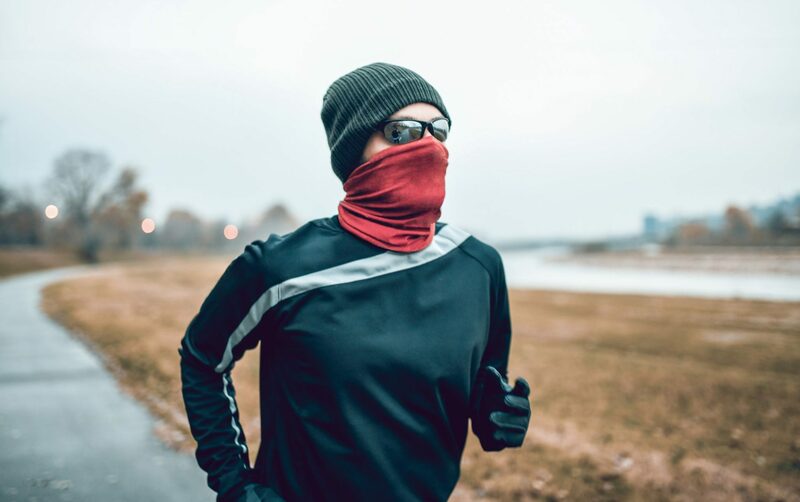 Now, let’s talk about essentials – what to wear when running in the cold. Layers – it’s tempting to put on as many clothing items as possible. BUT, your body temperature increases while running. So, dress for the weather that is about 15 degrees Wear breathable and lightweight layers. Top layer should be waterproof and windproof. 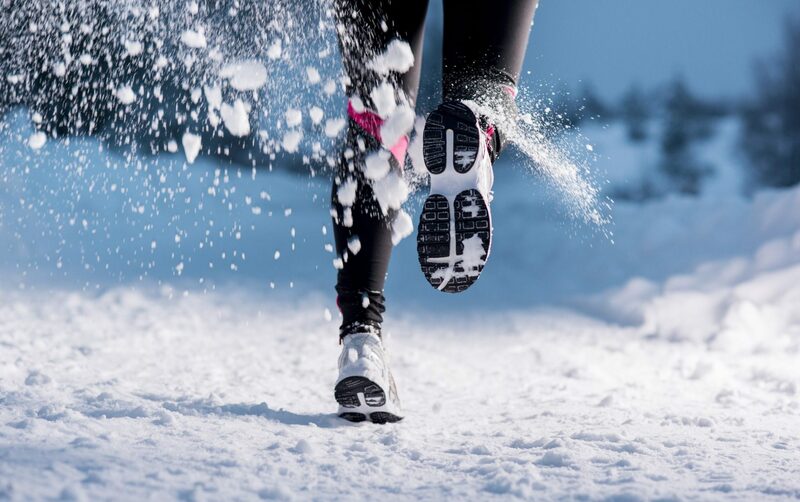 Proper shoes – fear of slipping on snow or ice negatively impacts your performance because you can’t land the feet properly. Plus, you can get injured. Adding Yak Tracks or Nano spikes onto your shoes is a good idea. Screw kits are also available at the sport apparel stores. The screws go into your shoes to help traction. Socks – wool is the best choice. It pulls the sweat away from your feet while keeping them warm. Leggings – better if worn underneath loose pants that protect you from the wind while leggings are holding the heat. Hat – we lose a lot of heat from our head. Gloves – keeping your extremities warm is the key for a good performance. Winter face mask – the dry, chilly air can cause bronchial spasms which restricts air from filling the lungs. Avoid the chances of burning your respiratory organs – the mask humidifies and warms up the air. Convince a friend to join you. We are all individuals with our own habits and rituals. To me jogging, swimming, biking – time to reflect, analyze and even dream. I like this me-time. Also, nature provides a break from the stimulus of every day life which improves positive thinking. Others prefer to have a buddy alongside. Find different routes – otherwise you could get bored. Calorie burn – good news for those who are seeking for the way to lose a few pounds! Cold air makes your body generate more heat, so you burn extra calories. Don’t make ambitious plans, as I’ve already mentioned it. Don’t set up yourself for a failure – thrive. Praise yourself for completing even short distances. Visualize hitting a homerun – figure skaters close their eyes and see the whole program and all jumps done impeccably – they envision success. You do the same – take a few minutes, picture yourself making powerful strokes, imagine how your whole body is energized and you are on the way to a well-off jog. There are no rules on how to run in the cold. But, it definitely requires courage. Regardless of rough weather conditions, put on your gear, turn on the favorite tune and hit your stride on the trail or sidewalk. Let’s pivot from winter melancholia to lightened-up mood.